French Toast is Vegetarian Food for everyone and famous in France. It make you fantastic because this french Toast make from tofu. Suitable for vegan. Blend all ingredients but the bread in your blender or food processor. 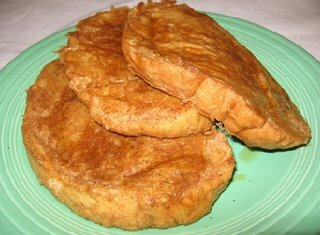 Heat a frying pan on medium-high, adding a little oil to keep French toast from sticking. Dip the bread in the tofu mixture until well-coated but not soggy and place a couple of dipped slices in the hot pan. Cook for a few minutes on each side until lightly browned. Make sure that before cooking each batch of French toast you add a little more oil to the pan. Serve with toppings of your choice. Such as honey, magarine and gam.